David Gardiner fills the room as he talks about a career in the rough-and-tumble outskirts of developmental biology. He twists in an office chair and flings his arms for emphasis. It's a good thing the desk is clear, or he would sweep it clean in no time. He recalls a comment that came back from peer review on one of many papers he co-authored with his wife, AAAS Fellow Sue Bryant. "It said, 'I'm tired of this iconoclastic view from Gardiner and Bryant,' " said Gardiner. "And it took me a while to realize that this wasn't a compliment." Gardiner, an AAAS fellow and professor of developmental and cell biology at the University of California at Irvine, has spent the last 30 years studying how salamanders regenerate limbs. His research has been largely supported by the U.S. Department of Defense, which is interested in improving the lives of soldiers who have lost limbs. "This is not science fiction," Gardiner said. "This is accessible science. Everyone out there either needs a regenerative therapy or knows someone who needs a regenerative therapy." The so-called iconoclasm in his work comes from a conflict among developmental biologists over how cells transmit the information to make patterns that eventually form structures such as organs and limbs. Before Gardiner met his wife, Bryant forwarded findings that suggested that all cells contain the information they need. The opposing view is that only some cells contain that information. "The reason we have a different point of view is that we work on regeneration," Gardiner said. In regeneration, cells may transmit information differently than in embryonic development. Gardiner's thoughts are as lively as his movements. He loves talking about every topic — politics, biology, diversity, academia. If you want him to discuss his research, you have to pin him down, and then, as he blasts through the fundamentals of regeneration, you have to ask again to make sure you got it all. He seems to wonder how he got to be an established scientist. He didn't collect bugs as a kid, he explains. He wasn't well-mentored. And he didn't like the idea of being a professor. He says that he decided on a college major after he heard something about marine biology at a high school career night in his home town of Escondido, Calif.
"I was perfect for it! A tall, blond white guy!" But when it comes to mentoring, he takes a serious tone. "I wasn't well-mentored, so I'm passionate about mentoring," he said, conceding that he wasn't at first very open to the mentoring. He describes his life as lacking in direction until he went to a conference and met Sue Bryant. At the time, he was teaching as part of a post-doctoral program at the University of California at Davis. He didn't feel like he was in the right job. Bryant, who retired this year as executive vice-chancellor and provost at the Irvine campus, had seen early career success with work on how patterns develop during regeneration. From the outset, her work was controversial. Bryant said that in Gardiner, she found a partner who shared "the willingness to think about science at a deep level." "I'm very attracted to science," she said. "I like having people to talk to about it. Having a partner in science is a really great way to have a career." Gardiner describes frantic sessions of scrawling research notes with his wife on napkins at Denny's during the weekends. "It was like something out of movie," he said. Central to his research is the idea that all animals carry the potential to regenerate limbs. It's a matter of triggering the regeneration process, which works in humans in the early embryonic stage. 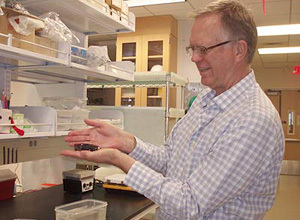 Gardiner, in recent years, has theorized that the processes that work in regeneration could also slow or reverse the damage inherent in aging. The gaps in knowledge go back to the basic questions in the research — what are the cells that have the information to form patterns? "That's the part that we don't have," Gardiner said. "The contribution I think I could make in my lifetime is to really nail that down — that these are the cells, and they are the ones that have the information. I actually think that's going to take a long time." In the meantime, he and Bryant are advancing the field in a different way by launching a journal called Regeneration. They expect it to launch in early 2014. "We've been marginalized," Gardiner said. He flings out his arms to dismiss the thought. "So anyway, now we have our own journal."